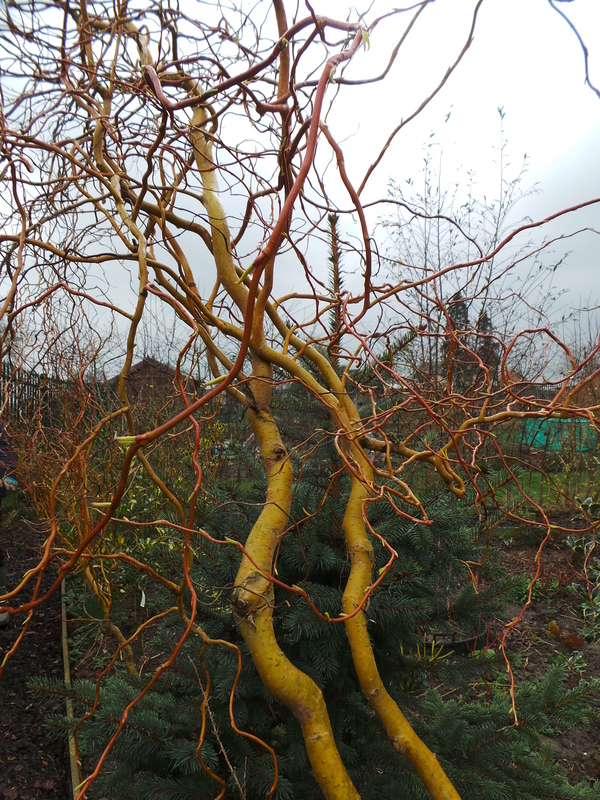 Here we grow many different varieties of Salix, willows with different habits, leaf shapes and in particular coloured bark. but before I move on to look at these I thought I would reminisce a little and cast my mind back to my childhood where willows played an important role. I lived in the vale of the River Severn in Gloucestershire and here, the lowland nature of the farmland meant that ditches had been dug for centuries around field boundaries to help with drainage.These ditches, and indeed every stream and brook was flanked with willows. These were pollarded and regularly harvested to be used by local craftsmen and women, the basket makers, trug makers and hurdle makers amongst them. But to me as a country lad they meant places to search for wildlife, to hide from the fishes I was angling for and in the case of the old giant hollow trunked willows they were dens to hide in. 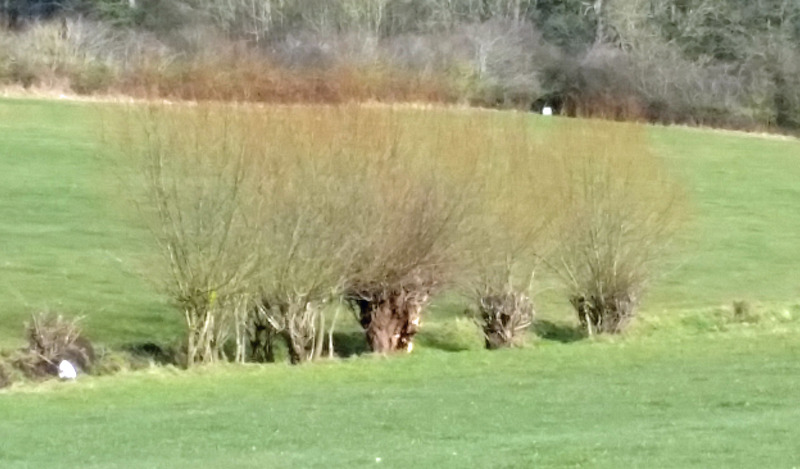 Below is a picture of a little clump of such pollarded willows in Herefordshire we spoted on our journey back from Croft Castle. 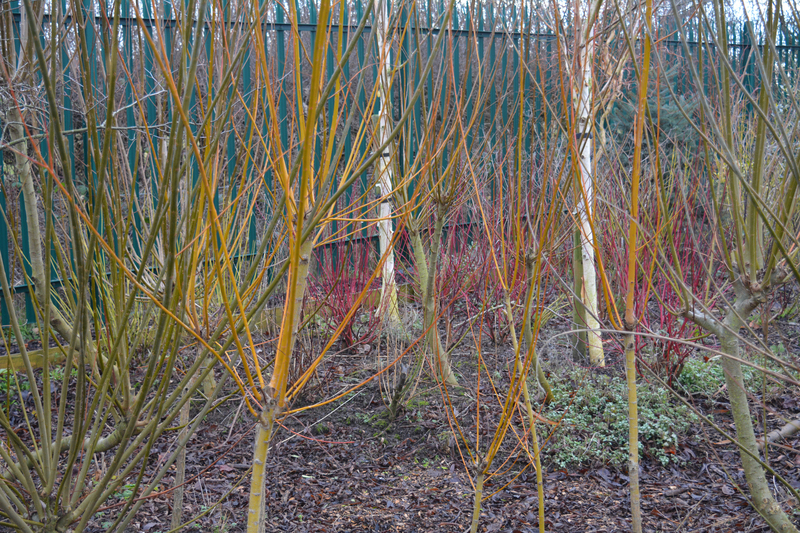 Most of our allotment willows grow in our Withy Bed designed to help drain a particularly wet patch of land but mostly to provide vivid colours when they are stripped of their leaves in the autumn and winter months. We also grow them to help drain a wet part of our Winter Garden. The photo below was taken looking through the willows towards the white barked Betulas and the coloured stems of the Cornus (Dogwoods). As well as draining this area so effectively they add so much winter structure and colour of their own to the picture. In the second picture of these same willows you can see they have just been subject to their annual haircut. 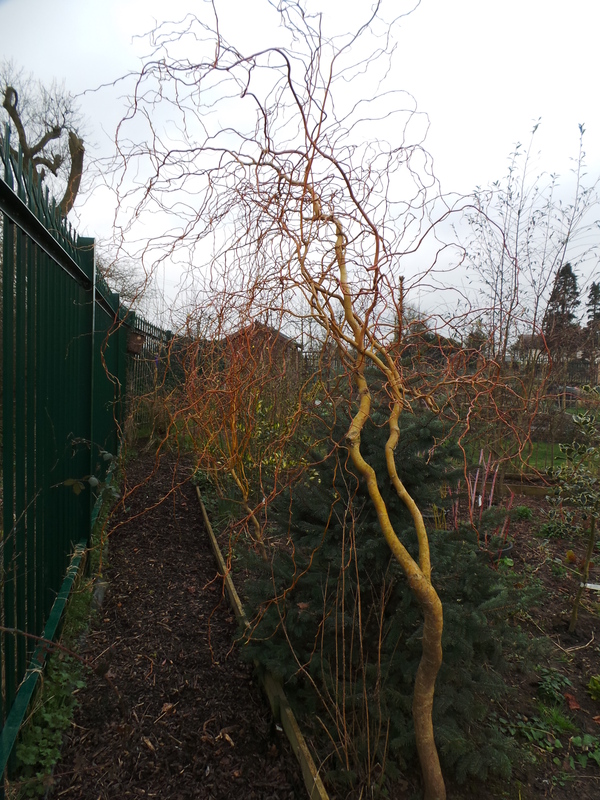 The contorted willow below is one of two being trained up tall to weep over the top of the path behind the Winter Bed to form an archway. 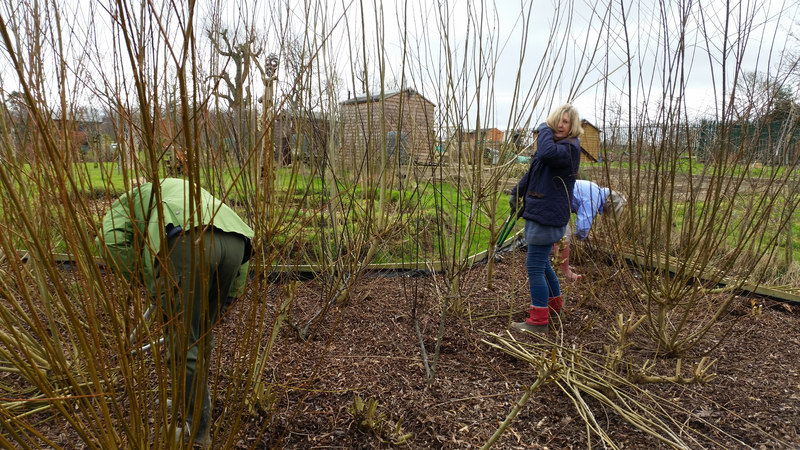 Each spring as the weather gets a little more conducive to outside work a group of us have our work cut out pruning so many willows, some we coppice and others we pollard at different heights. We have about twenty different cultivars here to enable us to achieve the effects that we are after. It takes a small team of volunteers a day’s work to get the task completed, resulting in some aching backs the following day. 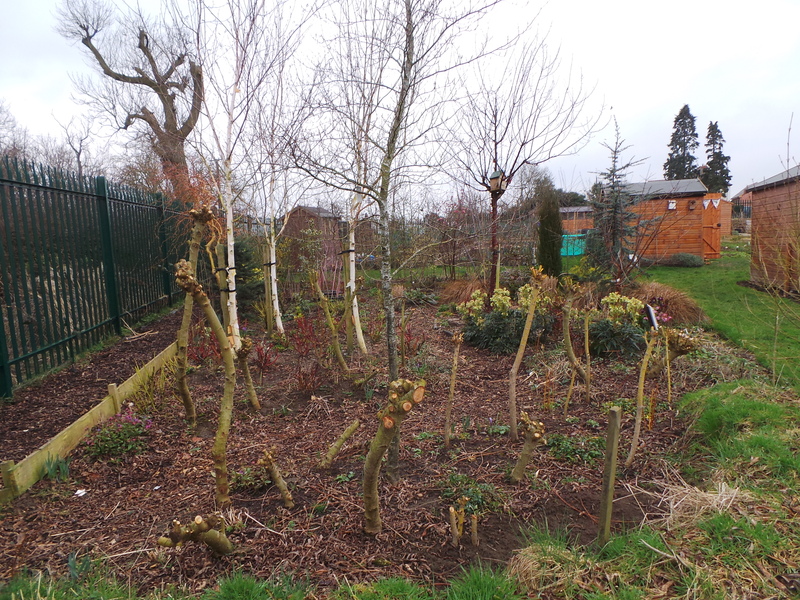 The first pair of photos shows a pair of before and after shots of one of our yellow stemmed coppiced willows. 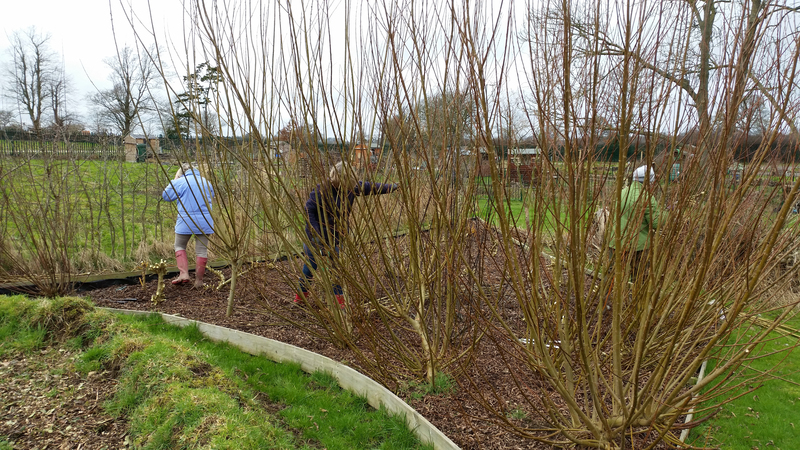 We set off with a wide range of pruners from small secateurs up to hefty loppers and slowly move from one end of the Withy Bed to the other with a good few tea breaks. We find it helpful to be bendy and wriggly to get in among the willows, bending low to the coppiced stools and reaching high to the tallest pollards and every combination in between. 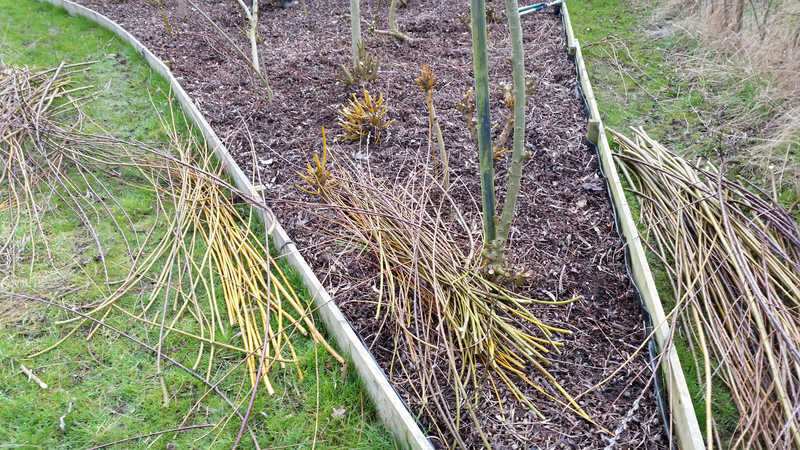 The prunings created when we cut them are used around the site to make structures and to create plant supports. But for this year many have been used while developing our new wildlife pond. The photos below show the prunings being kept fresh by being lain into the pond and illustrate the range of colours available to us. We have Violet Willow growing in the allotment’s Spring Garden which was a cutting off our tree at home and after four years it is a beautiful specimen which has sparkling silver catkins in Spring. 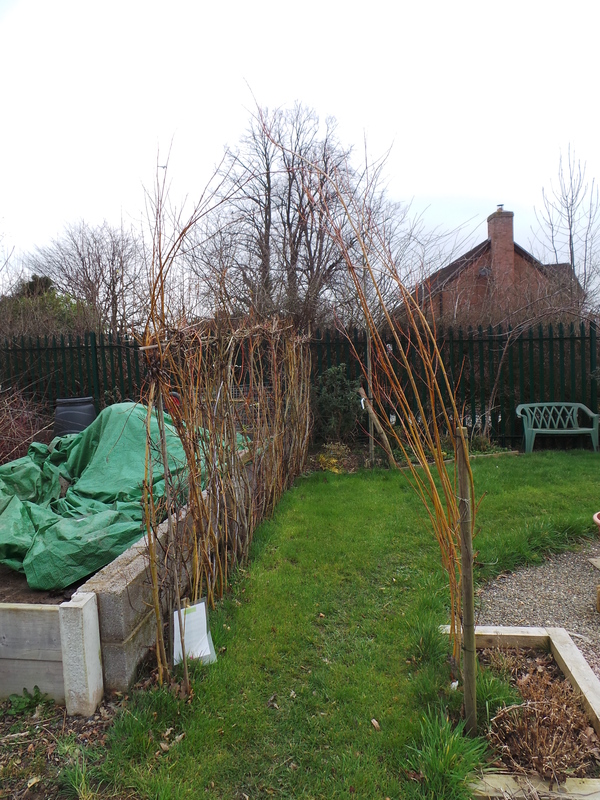 Last year we created a Fedge with the prunings to give us a brightly coloured living willow fence. 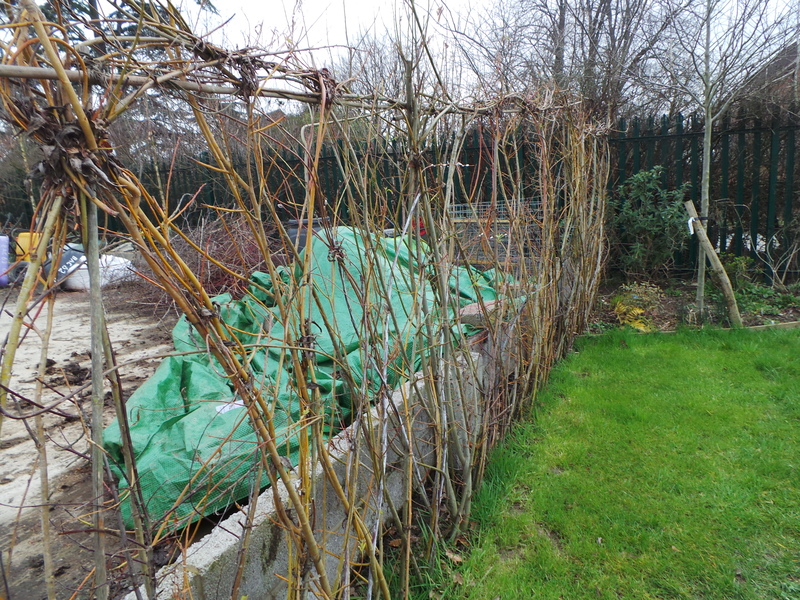 This acts as a useful windbreak and also hides part of the site’s manure/compost compound. In the winter when I took these pics it doesn’t hide much but the diamond shaped trellice effect shows up. 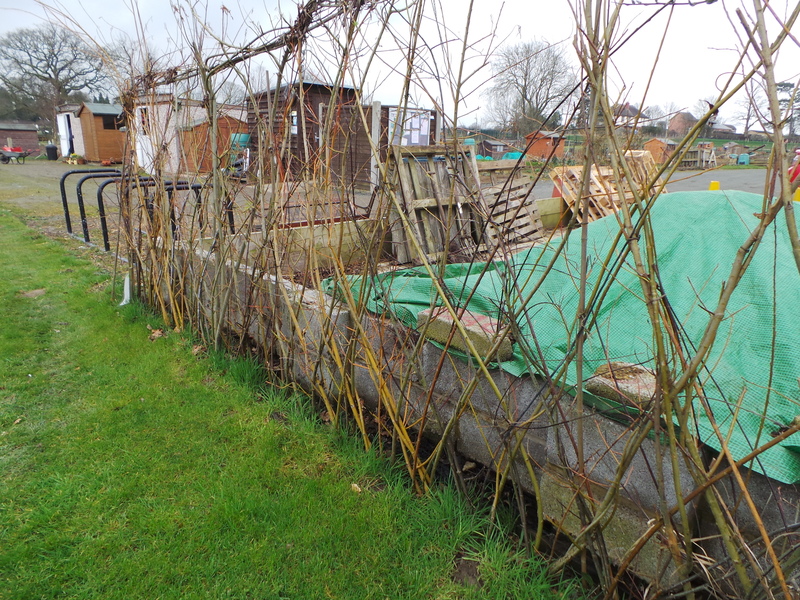 The final post in this series about willows will show how we have used some prunings from home and from the allotments to create a children’s play feature. This entry was posted in allotments, colours, community gardening, gardening, ornamental trees and shrubs, recycling, trees, Winter Gardening and tagged Bowbrook Allotment Community, communal gardens, community gardening, community spirit, pruning, recycling, recycling in the garden, willow, willow features. Bookmark the permalink. Enjoyed reading about this process and now I’ve learned the difference between coppice and pollard. 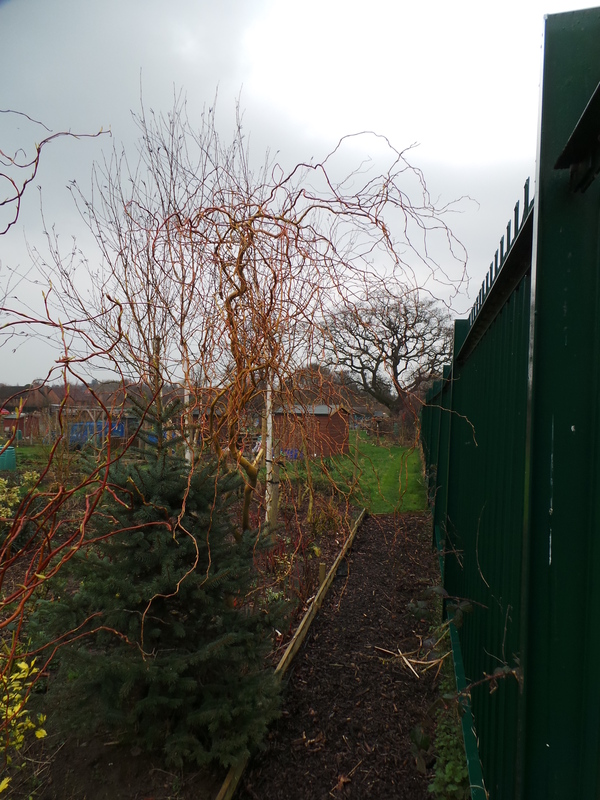 What a lot of work your group invests in the infrastructure for this allotment. 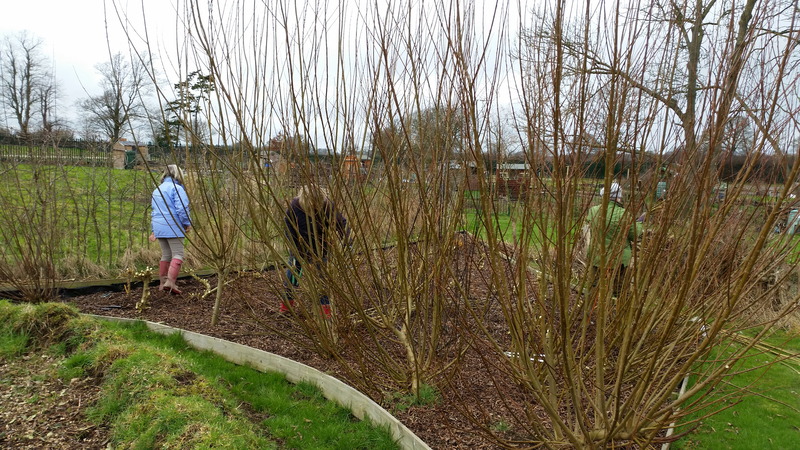 Pruning the willows is a popular task with several members so it soon gets done.